The last time I was in New York, I was in the mood for a burger. Since I was unable to get in touch with my burger expert friend, I decided to go off on my own in search of a good one (near my hotel). My trek brought me to a little joint called PJ Clarke's. It's kind of an old-school cocktail bar, with a smallish dining room in the back. When I walked in, I noticed a raw bar that looked and smelled pretty fresh, so I was fairly certain I would get some decent beef. Now, on to the burger. When it came out, it was not much to look at. It was a standard griddle-cooked burger. The bun likely came from a bag labeled "Wonder." However, one bite and I knew this was the real deal. First off, the patty was a bit thicker than your standard American-style burger. More importantly, there was some pretty high quality beef between those store-bought buns. It had a nice sear, and while cooked a bit beyond the medium-ish I requested, it was still perfectly juicy. Oh, the fat guy from Lost claims this to be his favorite cheeseburger, and you don't get fat eating stuff that you don't like. Burger Review : This isn't some orgasmic, blow-you-away burger. It's just a very good one. This joint is a favorite of Jorge Garcia from the show "Lost." This is an excerpt from his blog. "...I know people have their favorite burgers out there. And that's great. But if you ever want the best. Go here. If you get the burger there, get it how they make it. 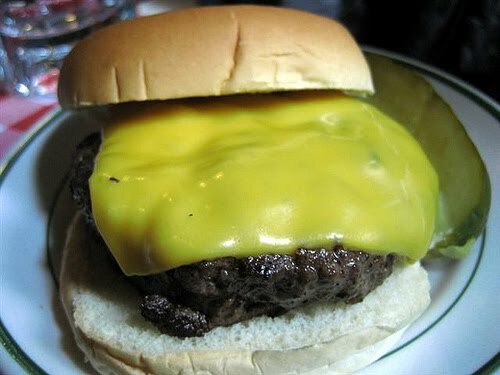 Just a plain cheeseburger. Don't put ketchup on it. Just take a bite. Trust me it doesn't need anything. The burger and bun will melt in your mouth...."
He's a fat guy, so he probably knows a good burger.